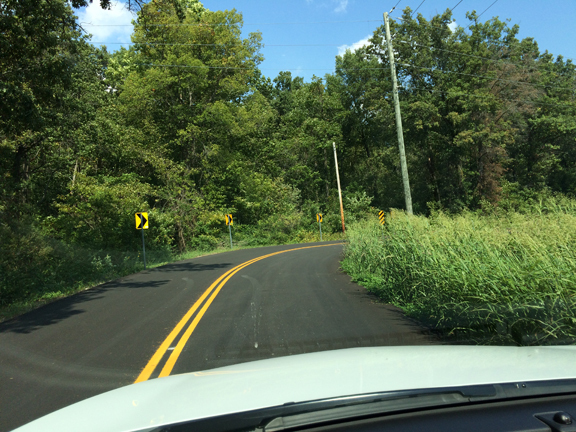 Updated 9/21/18 with new photos of Benne Road. 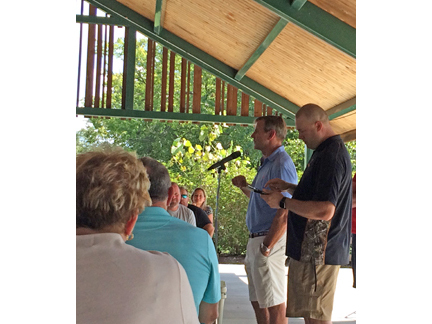 Between 50 and 100 people attended a neighborhood meeting on Sunday, Sept. 16, 2018 at Broemmelsiek Park to discuss the proposed Brewhouse that the William K. Busch Brewing Company would like to build on Benne Road. The meeting opened with a presentation of the plans by Marc Gottfried (brewmaster for the company) and Billy Busch (owner), followed by a question and answer period. Among the questions/concerns voiced by local residents were increased traffic, water table concerns, sewer treatment methods, odor from the brewing process, noise from outdoor music as well as traffic going in and out (particularly motorcycles), irresponsible drinking/drunk driving, and concerns that the site would eventually become another "Grant's Farm" drawing significantly more people than what is currently being described by Busch and Gottfried. Benne Road runs between Hwy. D, west of New Melle, eastward to Hwy. DD. There are about 20 homes that directly abut the road, but residents of Wilson Road and other surrounding areas also use the road. It is also a common "cut through" for people going to and from the Hwy. DD area and New Melle. One resident said she can tell when New Melle Sports and Recreation hosts a ball tournament due to the increased volume of vehicles. St. Charles County has not done a traffic count on the road since 1987. A press release announcing the new facility said it would have a maximum capacity of producing 2500 barrels of beer annually, but Gottfried said the facility could potentially be expanded up to 7500 barrels. Gottfried indicated most of the production and packaging of the Kraftig Lager and Kraftig Light cans and bottles will remain in Wisconsin, however the Kraftig keg line could be moved to the Defiance location. Gottfried said the company plans to produce four new craft beers at the sight, which will be produced in lower quantities and have different names. Some of those products will be consumed on site, some will be distributed in cans or kegs to other restaurants/retail locations. Gottfried said plans call for there to be one keg filling line and one canning line in the facility. When asked why the Benne Road location was chosen over other sites, such as the farm owned by Busch and his family on Hwy. 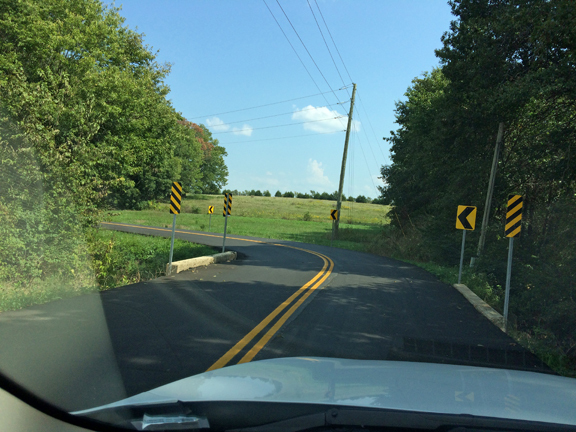 D just east of New Melle, Busch said the Benne Road site lays better and "because we can control the traffic better." He said the farm on Hwy. D is used for their own private family purposes. When asked about rumors that the polo field property south of Benne Road might be used to gain road access directly to Hwy. D, or out to Wilson Road through Country Life Lane, Busch denied both, saying that is nothing he has ever even considered. "Absolutely not," he said. Busch said there are no plans to do anything at the polo field related to this brew house, except house the research facility and temporary office space in an existing building on that site. When asked to explain his personal vision for the future, Busch said, "Right now we're building the facility big enough to brew 2500 barrels, as Marc indicated, we'll be happy if we are at that capacity by year three. If we grow beyond that, there is space available to add two cellar tanks which would put us up to 7500 barrels without adding on or changing anything there right now. As far as how will things look in 10 years, Busch said he could assure people that everything would, "be done with all of you in mind – in the best taste and something that is very positive for our community - something that will bring people into our community, and bring enjoyment in." Busch said, "You have my word on that, and that's the best I can give you." Busch said he wanted to continue the family brewing tradition. He wants to invite people to a showcase brewery, but he wants to keep it small, on a piece of land is incredibly beautiful, incredibly unique. "I have 7 kids, I would like them to continue that tradition and write chapter two of Busch brewing legacy." Busch said, "I don't want it ever to be too big but I would like to see it grow. At the same time, it's very important to me not to lose the beauty of the area. The last thing I want is smokestacks or a big industrial building muddling up this beautiful area. If we ever do grow really, really big, we have a great relationship with City Brewery in Wisconsin, and it has the capacity to brew thousands if not millions of barrels for us if we grow that big. I'd love to see us grow that big, but in this area, we want to keep it small. I want it to be a family-oriented, showcase place to come and enjoy the different aspects we talked about: petting zoo, crops, farm-to-table food, distillery, and the beer of course. That would be my dream." Busch said his father opened Grant's Farm to the public in 1954 and it is now considered the jewel of south county. He said, "That's not necessarily what is going to be here, but as this area booms, this is a something that's not going to allow housing on 150-200 acres. I would be pretty doggone proud to have that in my neighborhood," he said. Busch said he expected the brewhouse to increase property values in the area, but some nearby residents fear the opposite would be true. A resident of Country Life Lane, Mary Jo Dickson, told the Boone Country Connection that she and her husband, Tom, moved to the area three years ago because of the natural beauty and the strict zoning laws in place to maintain it. "If this facility is built in this location, the value and enjoyment we get out of our homes will be greatly diminished," she said. Tom Dickson said the narrow, winding roads are already overwhelmed with increased traffic from O'Day Park and Soccer fields on Hwy. DD, to Broemmelsiek Park, and another new park opening in New Melle this month. To further overload the roads with a facility that includes alcohol consumption puts a lot of people in harm's way. We will be at the mercy of a massive influx of recreational use traffic." Regarding noise, Busch said "We are going to be respectful to the utmost degree to everyone of our neighbors." He said the facility is 1000 feet from neighboring property lines and that they would be adding landscaping to help abate some of the noise. There was also discussion about the potential time of day and days of week for outdoor music. The Conditional Use Recommendation by St. Charles County staff is that all amplified music end by 10 p.m. and hours of operation be limited to 10 a.m. to 11 p.m. Monday through Sunday. Regarding potential odor from the plant, Gottfried said odors are released only during the brewing process, which would occur during maybe four 1-hour periods a week, and then would only be noticeable if standing right next to the building. He did not anticipate odors carrying to nearby properties. Mike Reth, who lives next to the proposed brewhouse site and who moderated the meeting, said the ambiguity and lack of detail in the Conditional Use Application is a big part of the neighbors' concerns. Both parties indicated they would be open to additional discussions. Regarding that ambiguity, years ago, there was an effort by some of the business owners in southwestern St. Charles County to increase the options available for tourism related businesses while preserving the rural/agricultural flavor of the area. Months of preparation went into establishing a new "AT – Agri-Tourism" district, which places restrictions on the size of those types of businesses and helps protect adjacent property owners. In June of this year, a new definition for a Brewhouse was added by the St. Charles County Council as a possible conditional use in the Agricultural Zoning District (not the AT District – though it does require that a portion of the AT rules be met) and as a permitted use in Commercial and Industrial zoning districts. Bill 4612 was sponsored by County Councilman Joe Brazil. It did not go through Planning and Zoning, and the Boone Country Connection was told by St. Charles County staff that neither a public hearing, nor a review by P&Z is required to add a definition to the Unified Development Ordinance (UDO) under current rules. As a permissive use in commercial and industrial districts, there appear to be no specific restrictions for a brewhouse as to the size of the facility, the size of the property, setbacks, etc. except as would apply to any other type of business in the Commercial or Industrial Districts. Section 405.520(F) of the Unified Development Ordinance of St. Charles County regulates the AT Zoning District. It has seven subsections. Only portions of Subsections 2, and Subsection 4 are mentioned above. The rest of the requirements that would be placed on a winery in the AT district zoning have been excluded by the above definition allowing a brewhouse in an A-Agricultural district. For instance, in Section 405.520(F)(1)(b), agri-related tourism conditional uses may not use or occupy more than 7% of the tract's total acreage. There does not appear to be any similar type limitation in the brewhouse definition. The AT zoning also requires a winery to cultivate at least 5 acres of grapes on site and requires a winery to use Missouri grown grapes in its wine production. There are no requirements for a brewhouse to grow crops of any kind on the site or use Missouri grown crops. In the AT zoning requirements, specific setbacks (150 ft) from adjacent properties have been established. The brewhouse definition that was implemented in June does not have that protection for adjacent property owners. The section limiting the height of buildings to one story was excluded. Section (F)(3) was excluded. It talks about defining the number of expected employees and patrons as well as uses that could generate more than three thousand gallons of waste water per year. There is no public water or public sewer system at the proposed site. Gottfried said they would be drilling a well to provide water. Area residents are concerned about the quantity of water to be used and if that could affect the water table that serves their own wells. One area resident said when the irrigation system is running at the polo fields, she notices a reduction in water pressure for watering her horses. If her property and the polo fields are served by separate private wells, that is a definite concern. The conditional use application mentions a proposed petting facility on the site, yet there are no references to any type of rules that might apply. What protections are built in for nearby property owners regarding those facilities? Setbacks, type of structure, noise, hours of operation, size of the footprint, number and type of animals, waste treatment, odor abatement, etc? None of those items appear to be addressed. Steve Sommerkamp, who lives on Dianna Lane and whose property abuts both the former Bridlespur parcel and Broemmelsiek Park, said, "What Busch has presented is basically a concept plan, not a detailed site plan. There is a big difference. The details need to be worked out now. Is the water table sufficient and sustainable? Where is the report from the U.S. Geological Society? How will the waste water be handled? There is no commercial sewer system in this area. Will a private waste water system be used? If so, what type will it be? How will it be monitored? Will they apply waste water to area acreage? Will it dump effluent into the natural waterways that drain across other properties or through Broemmelsiek Park? What exactly does the Dept. of Natural Resources require of private septic treatment systems? These are all unanswered questions." Summerkamp also quoted industry statistics that the craft brewing industry is growing by leaps and bounds. "This proposed brewery sets a precedent for the entire county. Is this really how St. Charles County wants to handle the potential growth of this industry? There is nothing in the Conditional Use Application nor Zoning definitions that limit the size or capacity of a "brewhouse." Shouldn't we take the time and effort to research this thoroughly now so that we are not faced with serious, unanticipated issues down the road? Once the CUP is approved, there's no reining it in down the road. At that point it's too late." There is a total of 245 acres involved in the two CUP applications. Sommerkamp said, "This needs to be examined in more detail and debated in public. For something that will be this impactful, not only to just our immediate neighborhood, but to all of St. Charles County, we should have more time and more factual information." Jim Real, who lives at #4 Country Life, is nervous about the entire Polo club property coming under the CUP. Busch says he plans no changes for that parcel south of Benne Road other than the research facility, but there is nothing in the CUP that would prevent expansion to that piece. County Councilman Joe Brazil but did not attend the neighborhood meeting at Broemmelsiek Park, which disappointed some in attendance. Brazil told the Boone Country Connection that he's talked to everyone who called him, but he does not attend meetings prior to the matter coming before the County Council in a public hearing type setting. "That's not how the process works," he said. Brazil said once a public hearing is held on the matter, that's when things will change. When asked why the definition of the Brewhouse excluded several of the restrictions that would apply to a winery, Brazil said he was not aware of that and said if restrictions were removed, he would see that they were put back. Michael Hurlbert is the Director of Community Development for St. Charles County. His department created the Brewhouse definition and determined that it would be treated as a conditional use in the Agricultural District, and as a permissive use in the Commercial and Industrial Zoning District. Hurlbert said he and his staff met with personnel from the William K. Busch Brewing Company. Then his staff researched other areas across the United States, and the brewhouse definition, as it is written, is a result of that research. There has been speculation by some in the community that County Councilman Joe Brazil requested that the Brewhouse definition also be added to the Commercial and Industrial Zoning Districts. Hurlbert responded "Absolutely not. Brazil probably didn't even know it. It was a matter of once we were looking at how would it fit, we wanted to make sure it was uniform in terms of where it's permissive and where it's permissible. It was set up as a conditional use in Agricultural so there would be a public hearing process to allow people's concerns to be heard and addressed." When asked about the more lax restrictions compared to a winery in the AT district, Hurlbert said "We were not necessarily trying to mirror the AT district. We based the definition on what we discovered in our research." The two applications for Conditional Use Permits will be discussed at the St. Charles County Planning and Zoning Commission Meeting on Wednesday, Sept. 19 at 7 p.m. in the Executive Building Council Chambers, Third Floor, (the Old Courthouse) 100 N. Third Street, St. Charles, MO 63301. The applications could then potentially be on the agenda for discussion at the St. Charles County Council meeting on Oct. 9, and potentially be presented for a vote on Oct. 29, 2018.
addressed a group of neighbors at Broemmelsiek Park on Sept. 16. A difficult, 90 degree turn on Benne Road at a narrow culvert. A second, limited site, 90 degree corner on Benne Road.